Originally, I found the pattern on ravelry which linked to a pattern on someone's blog but latter the pattern was linked to an old berroco pattern booklet. The yarn is Cascade 220 heather in the color Cordova. It's basically brown with flecks of red and yellow. 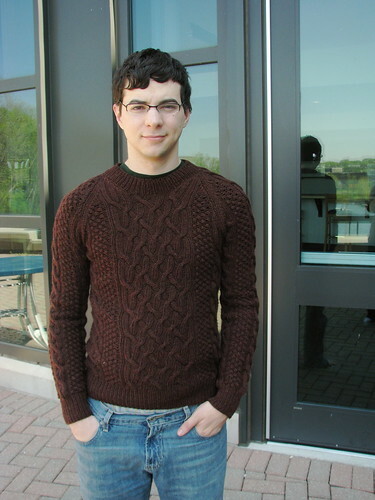 The sweater looked really skinny as I was knitting it because the cables pulled in so much. Before I blocked it it was only 15 inches across. After blocking it was 19.5 inches across. The pattern was written to be knit flat, but I modified it to be knit it the round. Also, the pattern was written out line by line so I charted it all out. Because it was knit in the round I had to do a small steek for the neck opening. I did a crochet line to secure the steek and it seemed to work pretty well. 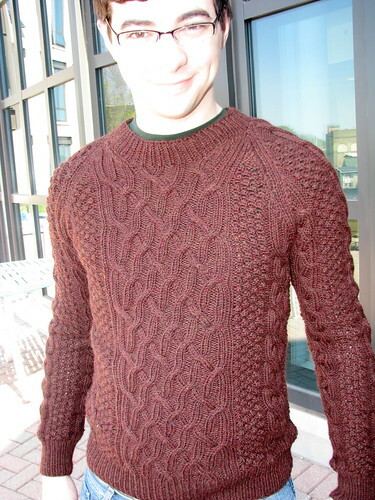 Of course now it's too warm to wear a wool sweater so I won't get to see my handy work in action for another 8 months... So I'm much later than most of the contestants but I'm finally crossing the finish line. Much less exciting, I got bored with the slow progress I was making on the sweater so I whipped up this hat quickly. Flattering picture I know... 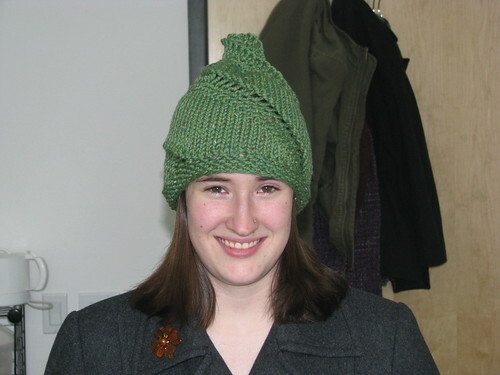 This is the Elizabeth Zimmerman Snail Hat. The patter is in Knitting Without Tears and it was also published in VougeKnitting this last winter. I have no idea what the yarn is. It was given to me by Andrew's sister without a label. It felted so it must be animal fiber and it's super soft so my guess is merino wool. It's a cute hat and it knits up in about 2.5 hours so I can't complain. How much have I been procrastinating this week?